I will start by saying that we are truly, truly blessed. My husband and I were talking last night, trying to balance the never-ending sense of loss with the powerful feelings of love and joy for our children. We are so very proud of all of them. They have all stolen our hearts and captured our souls. We will forever miss Nicholas. But we also welcome, with so much love, Madison to our family. I am convinced that Miss Maddie decided to grace us with her presence early to help calm her mommy's nerves. I am also convinced that Nicholas played a big part in bringing her to us safely. She is one of the lucky one's. She had Angel Wings guiding her the entire way. We got to the hospital about 1:30pm and I was immediately sent to triage to be monitored. Baby looked great. Contractions were in fact happening... and fast. I was dilating and all looked like we would be meeting our little girl that day. I was terrified. 36 weeks. Was it too soon? Would she be okay? Were we going to have 2 Angels in Heaven? The doctors and nurses assured us that 36 weeks was a good gestation and that everything was going to be okay. My blood pressure was high.... hmmm, I wonder why. The nurses continued to monitor it. When the OB came in to check on me she asked me if there was anything I was anxious about (besides the obvious - being in labour and in pain). Well, that's when the damn broke. The tears flowed. The sobs filled the room. All along I could feel my chest tightening and all along I was fighting it.. telling myself to relax. I opened up to the doctor about Nicholas and our horrendous ordeal only a year ago. She was amazing, as was the nurse, as was my incredibly brave and strong husband. It was the release I needed. 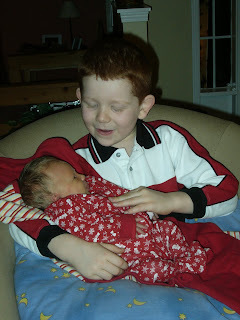 Immediately following, my blood pressure calmed right down and labour started to progress.... I am in awe of the human body. The human spirit. 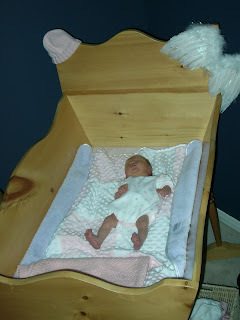 I was then admitted and got settled into a birthing room. I managed the contractions for about 8 hours (knowing that it was most likely the last time I would be going through child birth, I wanted to "experience" it as long as possible). I got the epidural about 7:30pm. 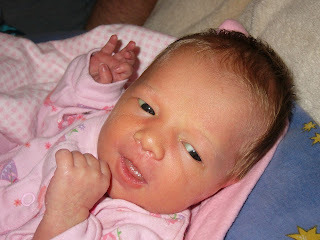 My mom came to be with us about 9 and our beautiful "Little Miss Sunshine" was born at 12:58am, Thursday, December 17th. It was incredibly emotional, incredibly peaceful, incredibly incredible. I only pushed about 4 times and out she came... beautiful, screaming and alive. I have to admit that when the doctor announced "meet your gorgeous daughter", I half expected her to say son... I made my husband check twice for girly bits! 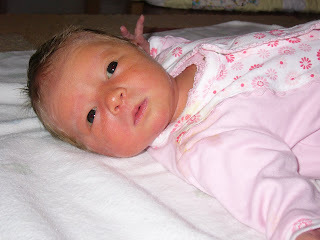 Madison was placed on my chest as soon as she was born and stayed there most of the night. In the early morning we decided it was best she go to the Special Care Nursery to check on her breathing... she had quite a bit of mucous that needed to be suctioned out. 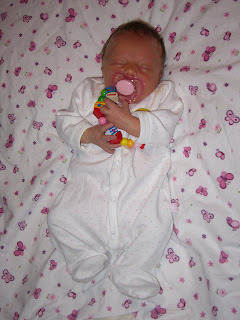 She was placed on CPAP for about 12 hours with minimal pressure and given a course of antibiotic to rule out infection. The hardest part about that was not having her in our room, beside us. The flashbacks were present. Back to the night we said goodbye to our precious boy. He wasn't with us either. He was taken to the "quiet room". He was not where he belonged. Special Care was the best place for Maddie. She responded well to the extra oxygen and the antibiotics and was out and back in our room Friday evening. We came home Saturday afternoon. One more note; we had a super fantastic nurse who was sent especially to us for Madison's birth. When she started her shift at 7:30pm she came in to introduce herself and quickly told me that she too has her very own Angel. Her little boy was born at 22 weeks just over a year ago and she was sure that she was our nurse for a reason. Well, that proved to be very true. We had an instant connection. An instant bond that only two grieving mothers can. She held my hand the entire time. She cried with me, she pushed with me, she supported me in a way I would never have expected. I asked her how she is able to work in labour and delivery after what she has experienced. She responded "women like you give me hope"... I amazed at her strength, her beauty and her determination. I already have a pair of Angel Wings made for her. Madison surely had two Angels guiding her safely to us that night. What a pretty little girl:) I got teary eyed at the end of your post. I'm so glad that everything went well and is well. She's so beautiful!!! Congrats! What a beautiful gift that another baby loss mom was your nurse. We all have such an amazing connection and I'm sure she was immeasurably comforting. Glad your little girl was home for Christmas! Also I love how her middle name includes Nicholas :) Nichole is my middle name too. Huge sniffly sobbing tears. Tears of joy, tears for Nicholas, tears for your angel nurse. There are too many of us out there. I'm so happy Maddie is here safe and sound. Congratulations, Mama! Madison is beautiful. I'm so happy for you and your family. she is gorgeous.. I am so glad everything (everyone) turned out well AND you were home for Christmas! what a sweet little miracle..BIG HUGS!!! She was born on my baby girl Charlie's 1st Heavenly Birthday. That is so amazing thank you for sharing your sunshine with us. Oh Lea, she is so perfect! I am so happy for you and your entire family. oh i'm in tears... what beautiful pictures and beautiful story.. the nurse is right, it is an inspiration. and i am amazed at the human body and spirit too. Yeah, we needed that good cry this morning! We love you guys, and rejoice with you. And I'm totally in love with Miss Maddie's middle name. Awesome. Congratulations, Leanna! Much love as you celebrate your Rainbow baby...your earth angels, while continuting to love your heavenly Angel. Lea, Madison is just beautiful. I love the pictures! It is amazing that you had that nurse. Nicholas must have sent her to you. I am sure she made the experience of bringing Maddie into this world so much more peaceful for you. She is so beautiful. Sweetest face and I love the hair. I am so happy with your Christmas blessing. Enjoy! I am crying tears of joy and relief for you. Remembering sweet Nicholas and wishing you a beautiful babymoon with Madison. She's gorgeous! All that lovely hair too, just divine. I am sure that nurse was sent to you, I'm so glad you had her. What a special experience for her too. I can't stop crying! Ack! Oh my gosh! You give me hope, too, sweet friend. You and Miss Madison, both. ((Hugs)) to you all. and you made me cry :-) of course that's not hard to do. congrats she is absolutely beautiful. Gorgeous girl... beautiful story. What a gift to be given, that amazing nurse, the release of your fear and then the birth of your daughter. Amazing. You are amazing. I am in awe. she is beautiful. you are a lucky family. She is so beautiful. Thank you so much for sharing this story with us. I am in awe of your family for your strength and beauty!!! Oh Lea! She is incredibly beautiful and prefect! Congratulations! What a great birth story! 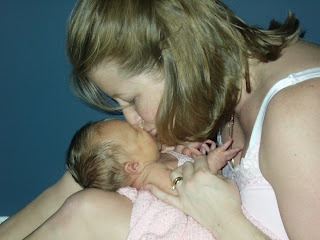 I am so amazed that you had that special nurse to help you through the birth experience, wow. That's so encouraging to read your story. 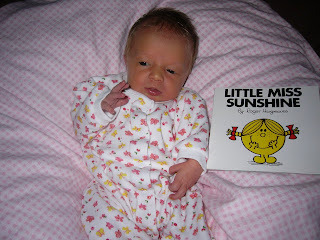 Such sweet, precious pictures of Little Miss Sunshine, congratulations! I am just so happy for you!!! Congratulations. I am so absolutely happy for you! She is just too precious!!! And what a beautiful birth, I'm sure that lovely nurse was so incredibly grateful to be there for Madisons arrival. What a gift you've given her on her healing. SOO SO very happy for the whole family....much love!